← Setting Intentions and Living the Life! The full moon of July is the Full Buck Moon. I get off from work, most nights at 11pm. I get to see the thru its phases and I always state this month I will do a Full Moon Dreamboard. 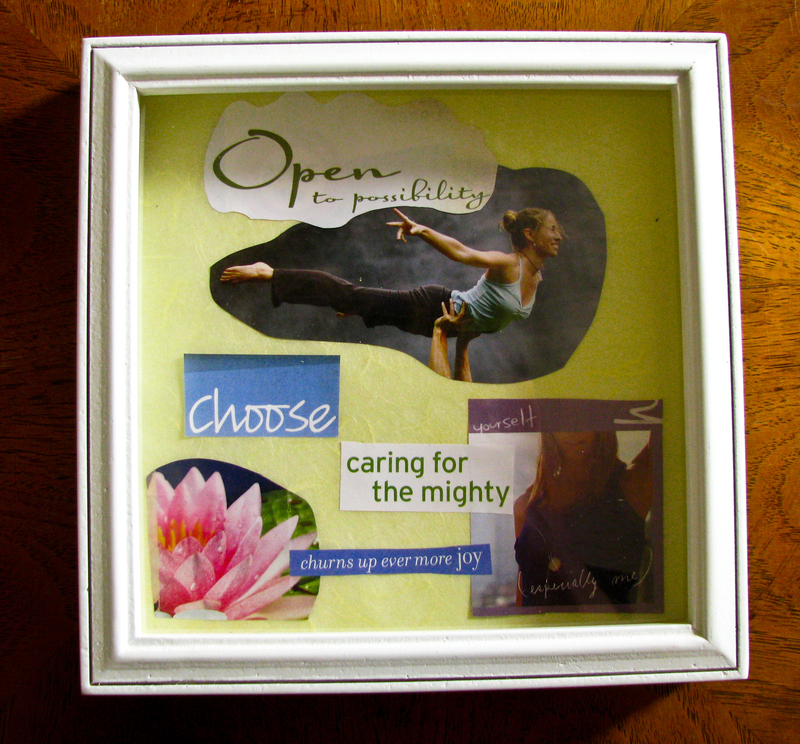 Vision boards have been a powerful imaging tool for me for a decade. But I have yet to initiate the energy on a full-moon. This month I accomplished my goal. I had wanted a rustic window and a board with depth and movement, layers of reveal. The gathering process led me in a different direction. It’s okay. The I have to admit I struggled with time. I thought, there is no way. No time. No space. But I breathed into my worry and released it. I accomplished my board in less than an hour. No excuses anymore. I told myself, if I only managed to clip two images and put them on a bulletin board so be it. But this came together, fluid. I love it! Next month I’m hoping to find that rustic frame that’s deep, 3-5 inches deep. I can dream-it. I can create-it. In the mean-time for this lunar month I am dreaming of: Massages, trail runs, rest, reading good books, beaches, yoga, and hugs. I’m dreaming bigger dreams too! Tell me your dreams and I’ll tell you mine! You too can participate with other creatives developing dreamboards with Jamie Ridler! Posted on July 15, 2011, in Spiritual, Verge and tagged dreamboards, full buck moon, full buck moon 2011, vision boards. Bookmark the permalink. 7 Comments. Love your dream board. The woman in the center looks so FREE. I think I will jot down your not about CHURNing up more joy. It feels energizing. It came out just perfect! Love it! I love it when we let go of trying and then things happen all by themselves. I did my dreamboard last minute, too. I thought, “ahhhh, It’s too late. I’ll just join in next time.” But some part of me went on autopilot and just started moving on it. And before I knew it, and to my great surprise, it all come together much to my liking and I was overjoyed with the result. All because I got out of my own way, something I find very difficult doing! Great board. It will come now that you have asked. Hi Kim. Great dreamboard- very pretty and open. Wonderful board. I see a very sweet tenderness in it. May your days be filled with many massages, nourishing runs and rests, good books, and soothing beaches to nourish your soul. I absolutely love that you framed it! What a cool idea and quick dreamboards are still powerful.